Small numbers of experimental vehicles were built in Scandinavia just before World War II. By the 1960s, the technology started to improve, in large part due to the independent contributions of Rostislav Alexeev in the Soviet Union and German Alexander Lippisch, working in the United States. Alexeev worked from his background as a ship designer whereas Lippisch worked from his own background as an aeronautical engineer. The influence of Alexeev and Lippisch is still noticeable in most GEV vehicles seen today. The Soviet Central Hydrofoil Design Bureau (CHDB), led by Alexeev, was the center of ground-effect craft development in the USSR; in Russian, the vehicle came to be known as an ekranoplan (Russian: экранопла́н, French: ecran "screen" + Russian: plan "plane", from эффект экрана effekt ekrana). The military potential for such a craft was soon recognised and Alexeev received support and financial resources from Soviet leader Nikita Khrushchev. Some manned and unmanned prototypes were built, ranging up to eight tons in displacement. This led to the development of the "Caspian Sea Monster", a 550-ton military ekranoplan. Although it was designed to travel a maximum of 3 m (9.8 ft) above the sea, it was found to be most efficient at 20 m (66 ft), reaching a top speed of 300 kn (350 mph; 560 km/h) (400 kn (460 mph; 740 km/h) in research flight). The Soviet ekranoplan program continued with the support of Minister of Defense Dmitri Ustinov. It produced the most successful ekranoplan so far, the 125-ton A-90 Orlyonok. These craft were originally developed as very high-speed military transports, and were based mostly on the shores of the Caspian Sea and Black Sea. The Soviet Navy ordered 120 Orlyonok-class ekranoplans. But this figure was later reduced to fewer than thirty vehicles, with planned deployment mainly in the Black Sea and Baltic Sea fleets. A few Orlyonoks served with the Soviet Navy from 1979 to 1992. In 1987, the 400-ton Lun-class ekranoplan was built as a missile launcher. A second Lun, renamed Spasatel, was laid down as a rescue vessel, but was never finished. Minister Ustinov died in 1985, and the new Minister of Defense, Marshal Sokolov, effectively stopped the funding for the program. Only three operational Orlyonok-class ekranoplans (with revised hull design) and one Lun-class ekranoplan remained at a naval base near Kaspiysk. The two major problems that the Soviet ekranoplans faced were poor longitudinal stability and a need for reliable navigation. Since the fall of the Soviet Union, ekranoplans have been produced by the Volga Shipyard in Nizhniy Novgorod. GEV developed since the 1980s have been primarily smaller craft designed for the recreational and civilian ferry markets. Germany, Russia, and the United States have provided most of the momentum with some development in Australia, China, Japan, and Taiwan. In these countries, small craft up to ten seats have been designed and built. Other larger designs as ferries and heavy transports have been proposed, though none have gone on to further development. After the collapse of the Soviet Union, smaller ekranoplans for non-military use have been under development. The CHDB had already developed the eight-seat Volga-2 in 1985, and Technologies and Transport developed a smaller version by the name of Amphistar. In Germany, Lippisch was asked to build a very fast boat for Mr. Collins from Collins Radio Company in the USA. He developed the X-112, a revolutionary design with reversed delta wing and T-tail. This design proved to be stable and efficient in ground effect and even though it was successfully tested, Collins decided to stop the project and sold the patents to a German company called Rhein Flugzeugbau (RFB) which further developed the model. Tandem flarecraftHanno Fischer took over the works from RFB and created his own company called Fischer Flugmechanik. Their two-seat Airfisch 3 and their later model that seats 6 passengers have been a successful design. This craft, the FS-8, was to be produced by a Singapore-Australian joint venture called Flightship. The company no longer exists, and the ship is out of production. An ongoing research project in collaboration with the university of Duisburg-Essen, involves the development of the Hoverwing. A number of companies have been heavily lobbying governments for development funding to pursue research and development of GEV craft exceeding 500 tonnes. The current worldwide trend in the decline in military research and development spending since the end of the Cold War era has not been conducive to funding the development of GEV craft. The perceived development risk is very high due to the untested nature of the technology and the uncertainties in the development process, operational costs and performance outcomes. GEVs have been suggested as the solution to a number of possible operational roles, with heavy lift being the most appealing attributes. GEVs have been proposed as an alternate to the very large aircraft needed to fulfill these transportation goals. The US Air Force report "Airlift 2025" looked at using GEVs as heavy-lift platforms with the capabilities of insertion into remote locations, long range and good survivability. In the report, GEVs were cited as inappropriate for the intended use as there was a need for another method of transport from the coast to the required destination. Another study by the US Navy’s "Strategic Studies Group XVI" also looked at the possibility of using small GEVs as insertion and extraction craft or naval gunfire teams. Also discussed were the advantages of using WIG craft for transoceanic cargo craft, where their increased speed would reduce resupply times by at least 60%. Civilian roles for GEVs have been heavily promoted at a number of conferences held since 1993. GEVs have been suggested as recreational craft, small to large ferries and large transport craft. A number of small companies have emerged designing and constructing GEVs for these purposes. A number of large Russian and US companies have gone as far as the preliminary design of a number of concept GEVs mainly for the transport and heavy lift market. Theoretical research into GEVs’ aerodynamics, ground effect and WIG craft stability has proceeded at a number of research centres. Performance enhancement of takeoff and landing distances as well as methods to increase sea state limitations have been analysed on prototypes and with model tests. Research continues into the determination of the most efficient platform configuration. Besides the development of appropriate design and structural configuration, special automatic control systems and navigation systems are also being developed. These include special altimeters with high accuracy for small altitude measurements and also lesser dependence on weather conditions. After extensive research and experimentation, it has been shown that "phase radio-altimeters" are most suitable for such applications as compared to laser, isotropic or ultrasonic altimeters. Even today R&D activities are being carried out for such vehicles in several countries, including Russia, USA, China, Germany, UK and Australia. Other future projects include the horizontal take-off and horizontal landing of Aerospace Planes (ASP) using ekranoplans. In Russia, the reduced defense spending has forced GEV manufacturers to look for potential sales in the civil market. A number of designs have been proposed for heavy transport while a small GEV, the Amphistar, has been produced in limited numbers. In 2007, Vice premier and defense minister Sergey Ivanov announced at a meeting of the naval board: "A federal targeted program will be created according to which Nizhniy Novgorod will manufacture wing-in-ground-effect vehicles". 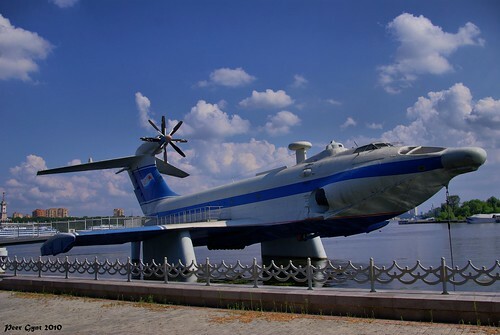 The designers of the Beriev aviation scientific and technical complex responded immediately and have promised to create the new ultra-heavy Be-2500 transport amphibious airplane. The Be-2500’s takeoff weight will be about 2,500 tonnes with a useful payload near 1,000 tonnes. Wing span is 125 meters, length is 115 meters and height is 29 meters. Cruising speed at altitude is 770 kilometers per hour, and in ground effect is 450 kilometers per hour. For comparison: wing span of the Boeing 747 is 64.4 meters, the airplane’s length is 70.6 meters, and height is 19.4 meters. Additionally, the civilian Arctic Trade and Transport Company (Арктическая Торгово-Транспортная Компания) produces "Aquaglide" ekranoplans, small craft capable of transporting five people including the pilot. In China, GEVs are being researched to fulfill a number of roles in the Chinese military and commercial use. The China Academy of Science & Technology Development and China Ship Scientific Research Centre (CSSRC) started GEV project in 1980. The 702 design bureau and 708 design bureau designed a number of small prototypes. In 1995, the first commercial ferry Tianyi-1 project started. In 1998, the first Tianyi-1 prototype is tested. In 2000, the model is for commercial sale in China. Currently a larger prototype Tianxiang-2 has been completed and a 50 seater Tianxiang-5 is under development. In the USA, a number of small companies have designed and tested a number of small ferry and recreational craft. The L-325 has gone into limited production and is for commercial sale in the U.S. Aerocon has proposed the development of a large GEV transport craft but does not appear to have gained sufficient funding for the project. In Germany, the military interest of the 1970s has decreased. As a result the German company RFB has shifted its emphasis from GEV development. The former technical director Mr. Fischer founded a company Fischer Flugmechanik which has designed and built craft for the recreational market, their most notable development being the Airfish recreational craft. Fischer Flugmechanik, in conjunction with Techno Trans research institute, have been sponsored by the German Ministry of R&D to develop a second generation GEV. This has resulted in the development of the two-seat prototype, HW-2VT. The leading German company for Tandem Airfoil WIG craft is the Botec GmbH, located near Frankfurt. In 1984 Phillip Morris Company awarded Dipl. Ing. W. Günther Jörg as the winner of the competition for Future Traffic Systems. Botec Company was founded in 1987 under the leadership of the Tandem Airfoilboat specialist Dipl. Ing. Günther W. Jörg . Dipl. Ing. Günther W. Jörg and his team have developed a large number of WIG craft for the civilian market, some of which have gone into limited production. The development of those TAF (Tandem Airfoil Flairboat) includes a number of craft in different designs and sizes. Botec GmbH has developed Tandem Airfoil Flairboats suitable for leisure boat applications and for commercial applications. Up to 2005, 16 Tandem Airfoil Flairboats had been built and successfully tested according to all rules and regulations. Dipl. Ing. Günther W. Jörg and his team have provided a lot of ideas scheduled for further applications in the commercial transportation sector. In Japan, GEV technology has been analyzed in order to gain a leading position in the fast ferry design and construction market. A number of research craft have been prototyped and tested but none have proceeded onto development. In Australia, there are a number of small enterprises, companies and individuals, the most newsworthy being the Rada and Seawing companies. These companies were established in the early 1990s with the goal of developing small commuter and recreational craft. None of the craft built by these companies progressed beyond prototype development. Neither of these companies are functioning at present, however the principals are still active in GEV development. In 2004, a company from Australia known as Sea Eagle emerged, and worked with China’s CSSRC to develop a civilian range of Class B Wing Effect Craft. Currently the Craft is flying in China. Sea EagleNew Zealand mechanic Rudy Heeman successfully adapted a 2-person hovercraft  as a wing in ground effect vehicle in 2010. One of the problems that have delayed the development of these craft is the classification and legislation to be applied. IMO has studied the application of rules based on the International Code of Safety for High-Speed Craft (HSC code) which was developed for fast ships such as hydrofoils, hovercraft, catamarans and the like. The Russian Rules for classification and construction of small type A ekranoplans is a document upon which most GEV design is based. However in 2005, the IMO classified the WISE or GEV crafts under the category of ships. Type A cannot operate out of ground effect. Type B can jump to clear obstacles by converting kinetic energy (speed) into potential energy (height), but cannot maintain flight without the support of the ground effect. Type C are certified as aircraft, with the ability to operate safely and efficiently out of ground effect. A ground effect craft may have better fuel efficiency than an equivalent aircraft flying at low level due to the close proximity of the ground, reducing lift-induced drag. There are also safety benefits for the occupants of the craft in flying close to the water as an engine failure will not result in severe ditching. However, this particular configuration is difficult to fly even with computer assistance. Flying at very low altitudes, just above the sea, is dangerous if the craft banks too far to one side while making a small radius turn. A takeoff must be into the wind, which in the case of a water launch, means into the waves. This creates drag and reduces lift. Two main solutions to this problem have been implemented. The first was used by the Russian Ekranoplan program which placed engines in front of the wings to provide more lift. The Caspian Sea Monster had eight such engines, some of which were not used once the craft was airborne. A second approach is to use some form of an air-cushion to raise the vehicle most of the way out of the water, making take-off easier. This is used by German Hanno Fischer in the Hoverwing (successor to the Airfisch ground effect craft), which uses some of the air from the engines to inflate a skirt under the craft in the style of a sidewall hovercraft.